Here's another photo of my Grandfather Taeke van Popta. He is the man in the centre back. 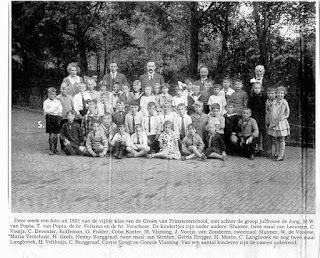 The picture, taken in 1931, is of the fifth grade of the "School met de bijbel", the Groen van Prinsterer School in IJmuiden, of which he, for many years, was principal. By the time he died in Sachsenhausen concentration camp, half the people in IJmuiden had attended his school (according to his daughter-in-law, Ida Visser van Popta). I've been reading all the links on Taeke with great interest. Thank you for sharing them! It is hard to comprehend that the latter part of Taeke's life was in God's plan from the beginning. But Praise God for Taeke's faithfulness and perseverance through all that he had to endure. Truly a remarkable man, and Regina a remarkable woman for having to raise her family alone.